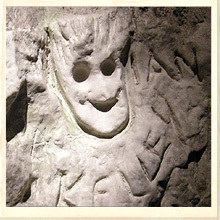 Chalk face carved into the tunnel walls – Francis Dashwood himself? Carving in the chalk walls The Grand Friar Sir Francis? 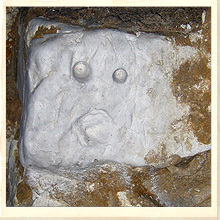 Chalk tunnel carving The Mysterious Lord Kelley. 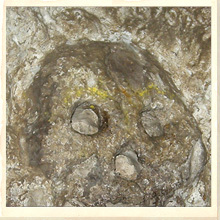 The Skull of the Banqueting Hall cave. 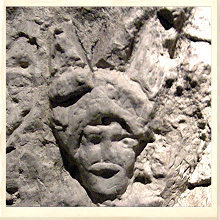 Chalk ‘Pan’ face carved into the Hellfire passages. The truth is that nobody really knows what took place both at the caves and at Medmenham Abbey and it is now widely believed that all the records were burnt by Paul Whitehead (along with his own works) three days before he died. If you read authors such as Daniel Mannix (and other sensationalist websites) then these caves were a hotbed of devil worship, human sacrifice and the seduction of virgins. If you read other sources then you will perceive a different picture but one that doesn’t sell books quite so well. Libertines and radical liberalism amongst the upper-classes were all part of the rich tapestry of life in the 1700’s. Secret societies were all the rage and the “must-have” accessory of the time. In addition, prostitution and mistress-keeping was a far more accepted activity then than it is today. 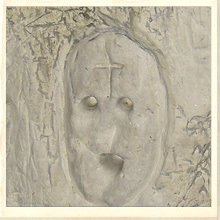 There is a record that the faces were carved by the original miners but this is unlikely. The reality is that life was pretty harsh for the common folk back in 1751 and after a back-breaking day of shovelling and hauling chalk to the surface the last thing on your mind is to carve some random faces. (But … who knows for sure.) It’s also worth noting that carvings such as these do not exist in other such quarries. There is also the possibility that the carvings were made at a later by people who visited the caves when they were just a little known local curiosity. If anyone reading this has specific information about these carvings we would appreciate it if you could send us an e-mail. A passage leading off the Banqueting Hall of the Hellfire Caves provides an idea of the size of the room. 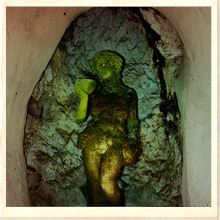 This strange chamber carved deep within West Wycombe Hill is thought to be the largest manmade chalk cave in the world. It’s so huge that it can, according to a promotional website, host 120 people standing or 54 seated. The floor space is estimated to be 1,256-square-feet in size and approximately 40ft in diameter. The ceiling is approximately 50ft high. The floor was originally made of chalk tile but this has since been replaced with more modern material. Radiating from the main hall are four alcoves or cloisters. Two are simply carved into the east wall leading nowhere. However, the two carved into the West Wall connect through to the outer passage or half-circle. Why this outer circle was not extended to encompass the entire hall remains a mystery as it is an obvious extension. One reason may be that the half completed passage is meant to symbolise the rising or setting sun which ties in with the theory of the intersect of Ra. Another possibility is that it was extended and then sealed again for some reason – again, possibly to hide further caves. A further possibility is that it was excavated in the 1950’s to bypass the collapsing ceiling of the main hall. The alcoves now (2009) house statues of Hercules, Venus, Aphrodite and Bacchus although it would appear that they are fairly recent additions. (Although, allegedly from Italy.) The alcoves themselves are also believed to have a relationship to points on the Compass. A member of the South Wales Caving Club (C. Timberlake) visited the caves shortly after their original restoration in 1958/9 and refers to empty chambers surrounding the hall that he was told were used by the “Monks” for their private devotions. He also records that there was a huge hook in the centre of ceiling from which a lamp could be hung. We didn’t see this hook when we visited in 2009 but admit we may have simple missed it. What we did notice was significant wire-mesh reinforcing that had been whitewashed / chalk-washed or painted to blend in with the remainder of the cave. Geographically, the Banqueting Hall lies over a hundred feet below the hilltop and “A short distance to the east of the Mausoleum”. This pretty much debunks the idea that the inner temple is located directly under the Church of St. Lawrence. Our own measurements actually place the “Inner Temple” quite some way off and aligns the River Styx with a small Brook (stream) north-east of the Church. Now, at least we have an explanation for the water source for a manmade underground river. 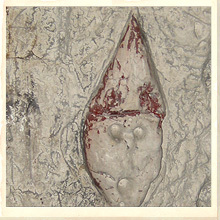 A small carving of a human skull is located on the western wall and is nearly obscured by an “Info-sign” labled “The Plan for Reconciliation and refers to a letter sent to Sir francis Dashwood by Benjamin Franklin. In 1953 a certain Mr Brooks of High Wycombe allegedly found a lump of chalk with coins embedded in it that dated from as early as 1720. 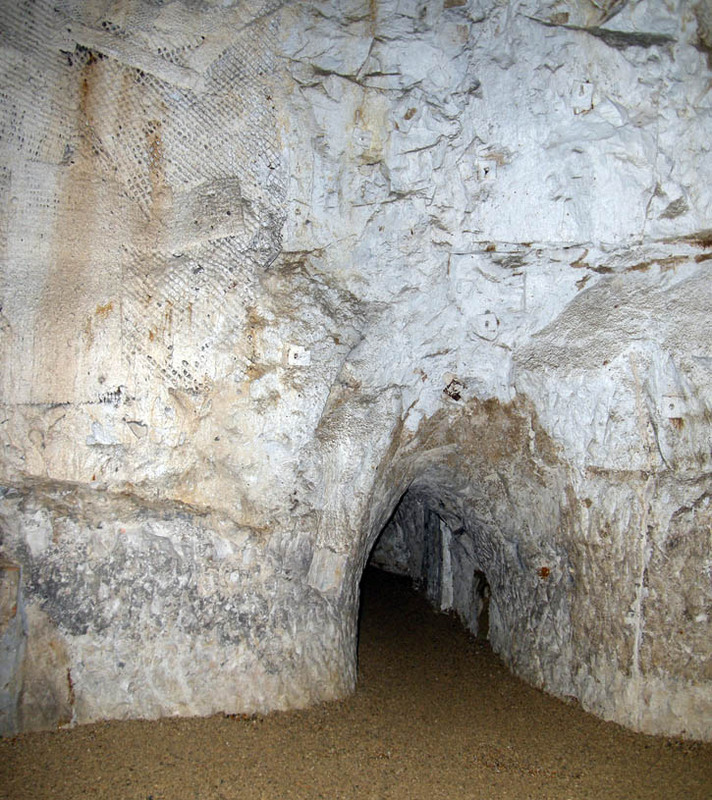 Some people have used this to suggest that the caves were excavated much earlier than the historical record suggests. Of course, this may be true but it is worth noting that coins last a long time. (Have a look at the change in your purse or pocket and you may be surprised by how old some of them actually are.) So … not conclusive proof at all. Paranormal investigators often mention that the Banqueting Hall usually measures a few degrees colder than the rest of the caves. They get quite excited about this. We’d like to remind them that it’s a big cave with a very high ceiling. Hot air rises when it can! We bet they’ve never measured the temperature at the apex of the dome. The truth is that nobody knows for certain what took place in this hall or these caves. They may have been nothing more than an exotic gentleman’s private drinking club or they may be the seat of dark satanic rituals and unspeakable abuse. Venus of the Caves The Great Banqueting Hall. 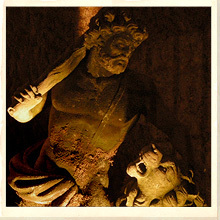 Statue of Hercules and the Lion in one of the recesses. 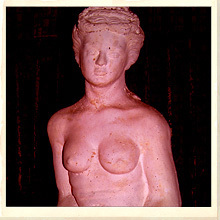 Aphrodite Originally brought from Italy? This is what we do know. They were used at least several times by the Knights of Sir Francis. They took considerable human effort to create and were designed to a geometric principle. The Banqueting Hall and the Inner Temple are the key to the geometric design. Over the years renovations, repairs and renaming has hidden the true story of the caves. Names of the caves have been altered over the years but it would seem that the Banqueting Hall has always had this title. The Nuns Cave but it was once called the Buttery. Today this cave area is signposted as either the Nun’s Cave or the Miners Cave but in 1958 it was called the buttery and referred to an area where barrels of drink were stored. What it was called in Sir Francis Dashwood’s time we can only guess. 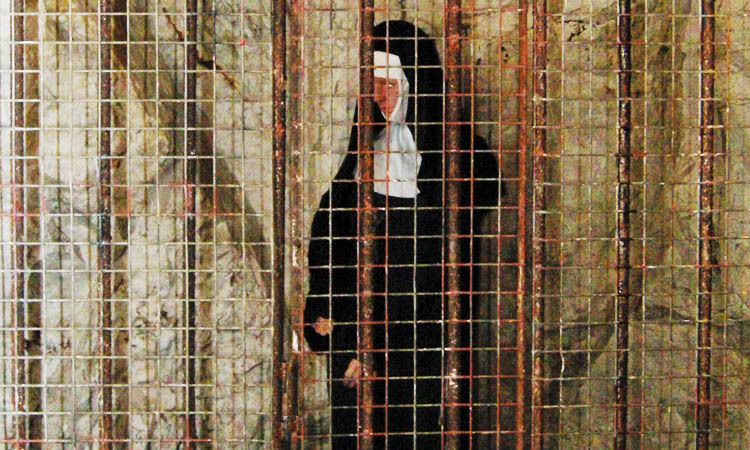 It may have been just another recess where the monks could entertain their lady guests or it may have had another purpose altogether. The term “Buttery” is derived from the old French word bouteillerie which was a place where wines and bottled liquors were kept. It is also related to the Latin word buticularia which was the office of the Taster of Wines. It is therefore likely that this was originally a wine store and may even be the Forum Vinarium. If any one has more detailed information from a reliable source we’d appreciate hearing from you.